Well, I thought that my non-nutrition/nutrition post a while back was going to be it. I was wrong. I’ve been asked repeatedly to discuss nutrition for racing since then, and after participating on a panel discussion on nutrition recently, I thought I’d revisit the topic. 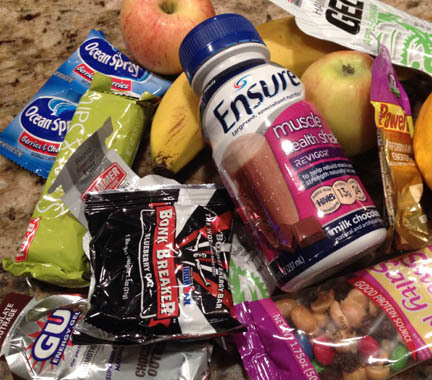 So let’s talk race day nutrition, or nutrition during exercise for that matter. There is a giant fog in the world of sports nutrition of conflicting advice, and studies to prove pretty much anything you want to hear. Most of these studies, even the institutional ones, have a bias or bend to them (There are some studies on the bias of research studies showing this. There is probably a study on those studies that study the studies. ha!). While there are some universal truths with nutrition, a lot of what you read will favor a company for marketing purposes. So most of the potions out there are just that. Why do I say this? Well if you read anything on Ironman racing, you’ll pick up right away that nutrition is one of the biggest issues that will affect your race. And that’s true. What is also true is that performances of athletes haven’t changed substantially over the last 25+ years, and most of those meager gains are attributed to technology and training, not nutrition. Case in point. The marathon (where all the nutrition decisions are revealed) course record in Kona is held by Mark Allen in 1989 in the epic Ironwar with Dave Scott. Mark ate bananas and Dave ate figs. That doesn’t necessarily discount the latest products on the market, but it’s not a ringing endorsement in all the “breakthrough’s” either. What has changed for the better is the delivery system. If you’re not into chewing real food you’re now in luck. You can take gels, chews, concentrated liquid, pills, etc to get the calories and nutrients you need. But the key here is what you need, not what someone has prescribed. There are some key factors in successful nutrition, and they have little to do with someone’s calorie calculator you find online. First and foremost, it has to agree with you. Spicy mexican food on the bike might not be the best option for a fast run. So pick foods that are easy on the digestive system. There are a million different formulas out there with “just the right balance”. Truth is you need calories. That’s it. Doesn’t need to be fancy. When you are exercising, some of the normal body responses shut off, such as blood insulin responses, etc. So a balanced meal isn’t really needed. Focus on what your body can digest, and that’s going to be different with everyone. Some will react better with a gel, some with a bar, and others with cookies or a sandwich. The second thing to consider is that your body digests better at lower intensities, or stress levels. If you’re sitting at a table, you’re body will digest the food better than if you are sprinting out of a burning building. You’ve probably noticed this when you try and eat something before a race when you’re nervous vs. after the race when you’re calm. The trick is finding that breaking point in which you body stops digesting, or even decreases digesting dramatically. Chris McCormack tested in a lab and discovered that in the heat of Kona, his body stopped absorbing most calories when his heart rate climbed above 150. While you may not have a high tech lab, you can still experiment with this in training. You will find that certain intensities will put the brakes on digestion. My tell on the bike is that I start burping if I ride too hard. If I slow just a touch and a few heart beats, stomach works fine. Find that point in training. Another thing to consider is the amount. This gets tricky, especially on race day. I will say this though. If you don’t eat enough and bonk, you have about a 20 minute problem. Get some food down, shuffle along best you can and you you’ll be back up and running in about 20 minutes. If, on the other-hand you eat too much, your digestive system WILL SHUT DOWN. That’s a problem that can last you until the end of the race, or longer. If you put too much in your stomach and overload it during exercise it can stop working until well after all the stress levels have lowered. All that vomit and diarrhea you hear about typically comes from someone forcing down tons of food because they’re on a schedule. It’s something that is very hard to turnaround. Get used to a regular visit to the port-o-cans until the race is done. So I would suggest avoiding the eating contest you often read about, and use amounts that have worked for you in training. After all, if you’ve prepared for this race and done the long rides with a couple of gels and some Gatorade, why would you need 10 times that amount in the race? Common sense says you don’t. Food and flavor preference is also something you need to consider. Sounds simple but we largely ignore it. You go out and train with a product that tastes OK but not great. Seems to do the trick. Now it’s race day and you’re 2 hours into the ride and tired of that crap. You still choke it down because you know you need it, but instead of drinking/eating it when you should, you put it off a few minutes. Next time a few more minutes. By the end of the ride you’re cooked because you’ve essentially missed a few feedings by way of procrastination. Do yourself a favor and get some comfort foods in there. Sick of gels and craving an Oreo? Then for the love of God pack some Oreos! Dying for some potato chips on the run? Go for it. Eating food you enjoy will get the calories you need just as well, and will lift your spirits as a bonus. Recently we brought in two time Kona Champion Tim DeBoom to speak, and he touched on nutrition. If you were in town and chose to skip this event, then you my friend are an idiot. The advice Tim gave that night was priceless. And while I’m not going to tell you all the information you chose to ignore, I will share with you this. Tim and some of the other pro’s he trained with (like 3x Kona Champ Peter Reid), worked on getting a “Steel Gut”. That is, they wanted to train their digestive system to handle pretty much anything that was thrown at them. (Dave Scott also mentioned that he prepared so “I could virtually eat anything I wanted“). So come race day when they needed to make changes, they didn’t have a dainty little tummy that could only handle 1 product without getting upset. So they rode on bean burritos, candy bars, and other gas station food in addition to the regular sports product. What that also did was get them to fully understand how they reacted to various foods, allowing them to refine what worked and what didn’t better. If you try 3 products, the odds of hitting a true winner is much lower than if you’ve tried 50 products. So work on nutrition in training to the point that you have many options on race day. Something is bound to go wrong and you’ll have to make a change or two. Prepare yourself so that you have many cards to play when that time comes. This means experimenting in training, and I mean really experimenting. Not trying 1 flavor of GU versus another, but rather 1 package of Combos versus a packet of applesauce versus cold pizza versus an energy bar that you’ve never heard of versus a PB&J versus potato chips versus NutterButters versus that new flavor of GU. Then after the race you can put your feet up and listen to everyone tell you their “I kept puking” stories and not have anything to share.